Ask a silly question, book a holiday, get more information. The Ortler Alps have at different times belonged to both Austria (in the South Tyrol) and Italy (as part of the Alto Adiege) and are situated close to the Swiss border. At the centre of the region is the Stelvio National Park encompassing 14 summits higher than 3000 metres, the highest of which is the Ortler peak at 3905m. Our six day ski tour starts and ends in the small village of Sulden. The highlight of this trip is the long day from the Casati hut to the summit of the Cevedale and the ski descent from Pasquale. ¤ Mount Cevedale - one of the best ski touring days out ever! Dates: 31 March - 7 April 2018. Price: 1450€pp includes accommodation, all breakfasts, lunches and dinner, collection from and return to Innsbruck. Extras: Lift passes, hire gear (180€ for the week + 70€ for avalanche pack). Day One: Arrival in Innsbruck in Austria and transfer to Sulden/Solda in Italy. We meet up in the evening to collect hire gear, chat with our guide and prepare for the week ahead. Day Two: We leave Sulden and use the cable car up to the ski area and then a further chairlift to the top of the resort. After a short ski we walk over the Passo del Madriccio and ski down through this secluded Madriccio Valley to the Zufalhutte Refuge. There is an optional local ascent and ski for those who have the energy in the afternoon. Day Three: We leave our heavy gear at the hut today and set off with just light packs across the valley to the foot of the Serena glacier. Then we move up along the glacier to the un-named pass at 3229m. Fantastic views, a great picnic spot and time to switch the skis into downhill mode for the long ski back to the Zufalhutte. Day Four: A long day ahead of us as we climb the 1200 metres to the Casati Refuge at the top of the Zufal glacier. This requires a steady but constant pace over stunning glacial terrain. We spend all day climbing to the hut, where there is a warm welcome and great food. Day Five: This is one of the best days out on skis you can imagine. We are already at high altitude at the Casati Refuge and from there we skin across the glacier to the Cima Cevedale at 3757m. Then we skin along the lengthy ridge that joins Cevedale to the Palon de la Mere (3685m) before the steep ski down to the Branca Refuge well below us in the valley. 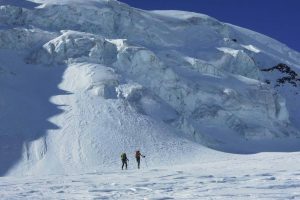 Day Six: The biggest single climb of the trip takes us from the Branca Refuge to the steep summit of the San Matteo peak – 3678m. This 1350m climb is on steep demanding glacial terrain and requires good technique – as well as a head for heights. The ski back down to Branca is fantastic. But from the Branca we pick up all our gear for a further 300 metre climb to the Pizzini Refuge where we spend the last night of the tour. Day Seven: From Pizzini we climb at first on skis and then on foot back to the Casati Refuge (and if we have time we’ll pop in for a coffee!). Then we head up to the simple Sulden Spitze peak before making the final descent back down through the seracs on the Sulden glaciers and skiing to the cable car station where we started the trip. We head back to a comfortable hotel for a well earned rest ! Day Eight: Transfer to Innsbruck for connections home. To book you can use the on-line booking system below - select the Saturday start date and Saturday end date and then proceed. The system will ask for a deposit which you pay using PayPal. Or, if you prefer, you can email us directly (sian@pyrenees-mountains.com), ring directly on +33 5 62 92 81 52 or Skype at sian.grigg.